The Circle of Bavaria, Drawn from the Best Authorities. 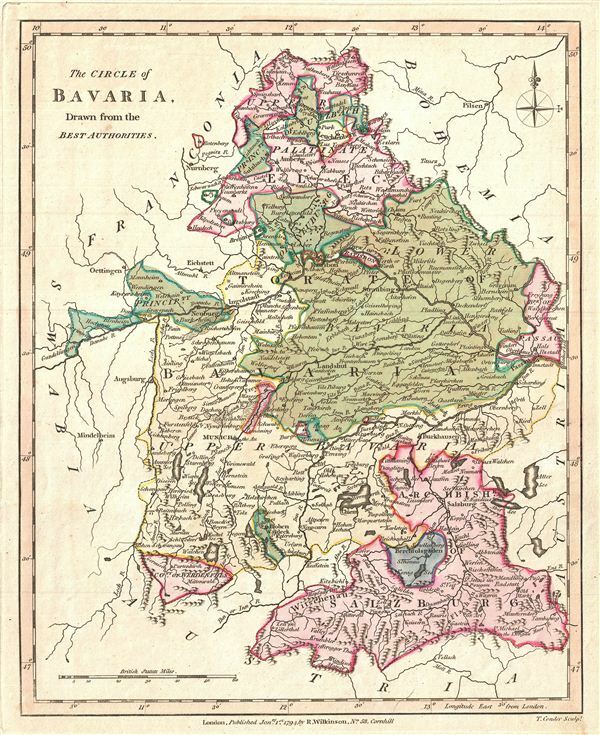 A finely detailed first edition 1794 map of Bavaria, Germany, by Robert Wilkinson. Prior to the French Revolutionary War and the Congress of Vienna, the Holy Roman empire's Circle of Bavaria included the Archbishopric of Salzburg, and was bordered by Franconia, Bohemia, Swabia, and Austria. After several wars with, and occupation by, Austria, the old Bavarian elector Max III Joseph died, leaving Bavaria and the electoral Palatinate to be governed once again in personal union. The Napoleonic Wars dissolved the Holy Roman empire in 1806, briefly making Bavaria an independent kingdom and doubling its size, until Germany consolidated in 1871.